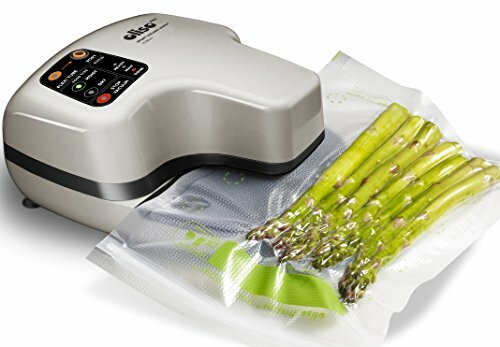 Top Four Premium Vacuum Sealers For Food (mid-range) and budget vacuum sealers. 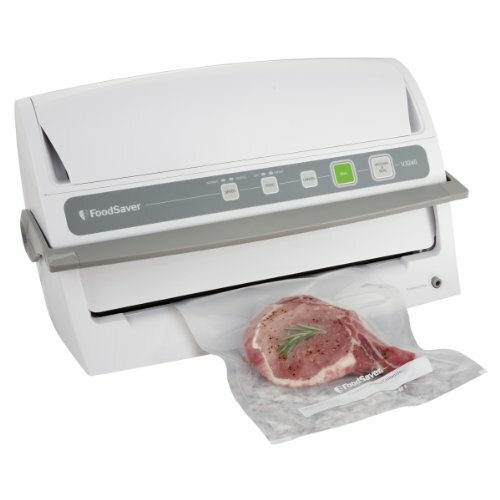 We've also done more detailed reviews on the very popular FoodSaver vacuum sealers for food, plus Weston brand sealers, and VacMaster brand sealers as well. At this price, this model is certainly one of FoodSaver’s more expensive products but it is also an extremely popular vacuum sealer. On Amazon alone, there are close to 600 reviews for the item, with an average star rating of 4.6. At the same time, this is also a feature-heavy product and includes adjustable speeds and settings for moist and for dry foods. This is also one of the few FoodSaver vacuum sealers that works with vacuum zipper bags, so it may be appealing for people who plan to use those bags. This is also a fully automatic model, which makes it very fast and easy to use. One other interesting thing about this particular model is that it has a retractable handheld sealer (on the left in the image), which adds to its versatility. This vacuum sealer has a slightly unusual design and uses a punch and seal approach to vacuum sealing, which seems to be unique to this company. The product has the ability to detect liquid and is marketed as the only option for vacuum sealing liquids without the use of an expensive chamber vacuum sealer. This alone makes the model extremely relevant for sous vide, especially as most other vacuum sealers specifically state that they cannot be used for liquids. The vacuum sealer also has the advantage of being very compact, which makes it very relevant for small kitchens. The reviews on Amazon suggest that despite the unusual design, the vacuum sealer actually ends up being easy to use and works without an issue. Some reviewers did comment that one disadvantage of the design is that it relies on specialized bags, which may make it more expensive to use the vacuum sealer on a regular basis. Nevertheless, the bags can be reused, so this helps to cut down some of the cost. 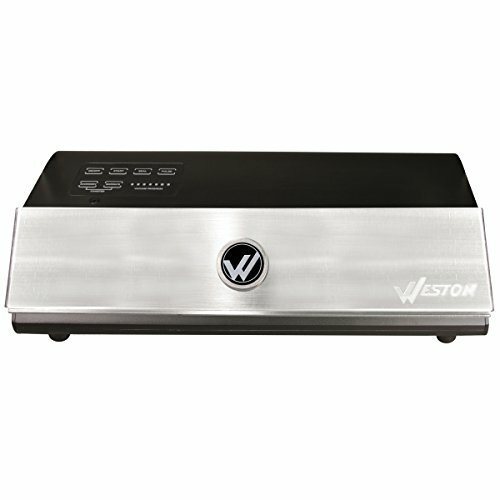 This Weston vacuum sealer offers a few interesting features that may be especially relevant to sous vide cooking. One of these is the way that the vacuum chamber is angled. This helps to prevent liquids from getting into that chamber and damaging it. In turn, this makes it easier to vacuum seal moist foods. The product also allows users to control the vacuum pressure, which is useful for vacuum sealing delicate food or objects. The model is also commercial quality and appears to be sturdier than many other models on the market. This suggests that it would last longer than other brands or models. However, most people who have purchased the vacuum sealer have not owned it long enough to be able to confirm how long it lasts for. This is another option from FoodSaver (which really does have a huge range of models). In this case, the vacuum sealer is less expensive than the one we mentioned earlier in the list but still offers a range of functions. In particular, it has two vacuum settings, in addition to a dealing mode that prevents food from getting crushed. The physical design of the product means that it has space at the top to hold a roll of bags for easy storage. However, that does mean this product takes up more space than many other vacuum sealers. This model also has the advantage of being one of FoodSaver’s more popular models, achieving around 1,700 reviews on Amazon. All of the vacuum sealers on this list have their advantages but the one that we would recommend most heavily for sous vide cooking is the Oliso Pro Smart Vacuum Sealer. This model uses a different approach for vacuum sealing than any other product on this list and that difference makes it more versatile. With sous vide cooking, you do often want to seal bags that contain some liquid, especially if you are planning to cook meat. 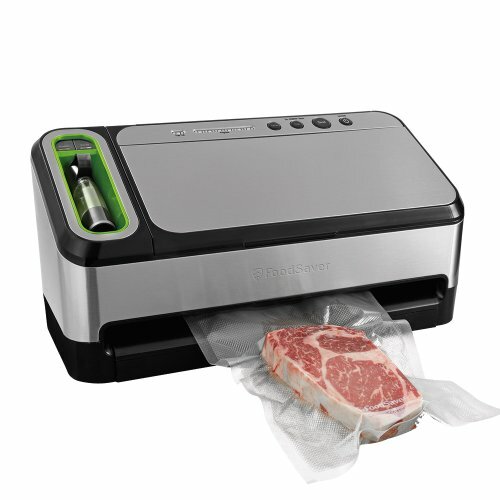 This model appears to handle liquid much better than any other type of vacuum sealer in this price range. This alone is a reason to seriously consider the model. The compact nature of the model is also an advantage and makes this suitable for any kitchen.